Apple on Thursday unveiled two new MacBook Pro laptops, adding a touch more power to the line. Both the new 13-inch and 15-inch models will be offered in silver and space gray. They have a Touch Bar that replaces the row of function keys found on laptops, as well as a Touch ID fingerprint scanner incorporated into the power button. They sport a Force Touch trackpad that’s twice the size of the trackpad in previous models. 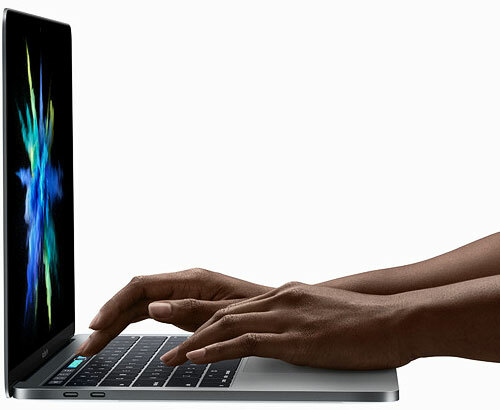 The new 13-inch MacBook Pro is 14.9 millimeters thick, 17 percent thinner than its predecessor. It’s also smaller — 23 percent by volume — and at 3 pounds, it weighs half a pound less than the previous version. The 15-inch unit is 15.5mm thick, 14 percent thinner than previous models. It too has a smaller footprint than its previous generation, 20 percent by volume, and it tilts the scales at 4 pounds, also a half pound lighter than its predecessor. Both units have an improved version of the “butterfly” keyboard introduced in Apple’s 12-inch MacBook, as well as a key dedicated to Apple’s digital assistant Siri. They also have four Thunderbolt USB-C ports that can be used for a variety of tasks, including charging the units. “Four Thunderbolt ports are a tremendous amount of bandwidth,” said Kevin Krewell, principal analyst at Tirias Research. The MacBook displays also have been upgraded. For example, the screen on the new 15-inch model is 67 percent brighter, with a 67 percent greater contrast ratio and 25 percent more colors. The new 15-inch MacBook Pro runs on a 6th generation Intel Core i7 quad processor with 2133 MHz memory. It has Radeon Pro graphics based on AMD’s Polaris architecture. It can deliver graphics 2.3 times faster than the previous generation of the laptop. The unit now supports up to 2 terabytes of solid state storage, and it’s faster — 50 percent faster than the previous model. The speakers also are better. They not only produce greater volume, but also have two times the dynamic range of previous models. The new 13-inch model runs on 6th generation i5 or i7 Intel chips, also mated to 2133 MHz system memory. It has Intel Iris graphics, as well as storage speeds twice those of its predecessor. The Touch Bar feature on the new MacBook Pros definitely was the star of the Apple’s Thursday show. The bar is a high-resolution touch display that replaces the function keys on the laptop. The display is context aware, so it can change its content based on the application running in the foreground of the computer. “It’s a disruptive new implementation,” said Werner Goertz, a research director at Gartner. The bar acts almost as a second monitor. Items can be dragged from the main display to the bar. “That’s something that will capture the user’s imagination and will be a great differentiator for Apple going forward,” Goertz said. The Touch Bar is a game changer for Apple, according to Tim Bajarin, president of Creative Strategies. “It allows not only Apple, but also developers to create custom connections to their applications, and make those applications more interactive and easier to access,” he told TechNewsWorld. Along with the new MacBook Pro announcements, Apple revealed a new app for Apple TV and iOS aimed at unifying a user’s TV experience. Called “TV,” the free app displays an aggregate view of all shows and movies the user currently is watching through other apps. It also recommends programming based on the user’s tastes. It provides access to a library of iTunes purchases and rentals, and a store for buying more content. “We want Apple TV to be the one place to access all of your television,” said Apple CEO Tim Cook at the Thursday event. With 1600 apps available for Apple TV, it’s become necessary for someone to step in and make it easier to discover and organize content, explained Bajarin. “The new TV app is designed specifically for that purpose,” he said. Apple TV will be a growth area for the company in 2017, noted Trip Chowdhry, managing director for equity research at Global Equities Research. Although Apple believes its TV app will completely change how people will watch TV, Gartner’s Goertz maintained the app will be less disruptive than Apple expects it will be. The absence of any mention of Apple TV’s potential as a smart home hub was disappointing, Goertz added. “Apple is still lagging behind the Amazons of this world when it comes to the smart home,” he said. There was no hint of restraint in Apple CEO Tim Cook’s enthusiasm, however. “We couldn’t be more excited about having our best product lineup ever heading into the holiday season,” he said at the close of the event. The new 13-inch MacBook with function keys sells for US$1,499 and is available immediately. The Touch Bar models are available for preorder and will go on sale in two to three weeks, with the 13-inch version selling for $1,799 and the 15-incher for $2,399.